Lesley Young, Centre for Equine Studies, Animal Health Trust, Newmarket, UK. Your horse's heart is a pump that supplies all his muscles and organs with oxygen and nutrients and carries away the waste products. It does this under all conditions: when he is galloping after hounds, or when he's asleep. To do this efficiently, the heart is divided into two sides: the left side takes oxygenated blood from the lungs and supplies muscles and vital organs, like the brain and kidney. The de-oxygenated blood then returns to the right heart to be pumped to the lungs, where it is replenished with oxygen. Each side has a muscular pumping chamber, the ventricle, and a collecting chamber, the atrium. With each beat, a typical adult horse pumps approximately one litre of blood out of each side of his heart, this is the stroke volume. With a resting heart rate of 30 - 40 beats per minute, this means the total blood pumped in one minute, the horse's cardiac output, is 30 - 40 litres per minute. Contrast this to man with an average output of 5 litres per minute and we can begin to see why the horse is a much better athlete. The heart is an "intelligent" pump, but has a fairly limited range of options to increase its output to meet the increasing demands of exercise. When the heart beats, it does not empty completely, instead a proportion of blood remains in the left heart chamber. When exercise begins, circulating adrenaline makes the contraction of the heart muscle more forceful, so more blood is ejected from the ventricle with each beat. Additionally the huge muscles of locomotion contract and squeeze more blood back to the heart increasing the amount of blood available in the circulation and further increasing stroke volume. Resting heart rate is between 28 and 36 beats per minute in Thoroughbred horses. Maximum heart rate during peak exercise in the Thoroughbred is between 225 and 240 per minute. The huge range of heart rate is the most important mechanism for increasing cardiac output during exercise, especially as work intensity increases. Heart rates above 200 beats per minute ensure that cardiac output increases from 35 litres per minute at rest to above 200 litres per minute during maximal exercise. What happens when my horse gets fit? Just as the muscles of locomotion become stronger and better able to do their job efficiently, so too does the heart muscle. Using ultrasound, (a method to visualise the horse's heart), we are now able to measure cardiac dimensions very accurately and assess how efficiently it works. We can also monitor what happens as the horse goes through its training programme. By scanning large numbers of flat-racing Thoroughbreds in two training yards in Newmarket, we know that the amount of heart muscle, and the width and area of the left heart chamber increase dramatically with training. Increased heart volume allows the heart to hold more blood at rest and during exercise, whilst increased muscle also allows the more powerful "fit" heart to eject more of this blood with each beat. These monitors detect the electrical signals that instruct the heart to beat. As each electrical signal is accompanied by a physical contraction of the heart, they are accurate monitors of heart rate. 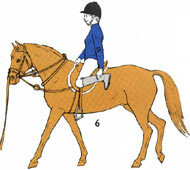 The horse wears flat electrodes and a transmitter device under the saddle. The heart rate is transmitted to a watch monitor worn by the rider. These monitors can be of varying degrees of complexity and expense: All of them give an instantaneous heart rate, the most expensive units allow accumulated heart rate information from one or more training sessions to be downloaded into a personal computer. What can my horse's heart rate tell me? Increased stroke volume caused by training means that the athletes heart beats less frequently at all times, including during periods of rest. Because of the greater volume ejected from the "fit" heart with each beat, cardiac output remains the same as in the untrained state, although the heart beats less often. So it should be possible to see a difference in your horse's heart rate at rest before and after training. Indeed the true resting heart rates of conditioned racehorses are often at, or even below, 30 beats per minute. In human athletes the effect of training on resting heart rate is marked. For example, the average heart rate of the competitors in the Tour de France cycle race was below 40 beats per minute compared to the average for a normal man of 75 per minute. In horses, with a much lower resting heart rate to start, not only is the effect much less marked, but their character often masks our ability to detect it. In horses heart rate is greatly influenced by stress and anxiety. The very act of measuring heart rate is often sufficient to increase it by 3 - 4 beats per minute, enough to mask any changes induced by training. Heart rate during exercise is an invaluable monitor of the cardiovascular system, fitness and performance. The speed at which heart rate recovers after work also reflects cardiovascular fitness. During any exercise session the heart rate can be used to determine when the horse is sufficiently recovered to gallop or canter again. Heart rate monitoring also allows us to train specifically for endurance or speed. This is the basis of interval training, a technique that has been adopted almost universally in human athletics. Since the advent of interval training, records in every human track event have been smashed, as athletes benefited from optimal cardiovascular conditioning. Whilst breaking records may not be goal of most of this article's readers, it is important to appreciate that fatigue is the most common cause of injury in equine athletes. A tired horse will lose his action and be prone to tendon, joint and ligament strain. When any horse's heart rate exceeds 200 beats per minute and approaches maximal heart rate, the horse will fatigue within a short time. No matter how much he is urged the horse cannot give any more.The table shows the average heart rate and respiratory rates of conditioned Thoroughbreds undergoing treadmill exercise at gradually increasing speed. You can see how heart rate increases as the workload goes up to the next speed. When an individual's heart rate is monitored over time and over a standard piece of work, the rider knows exactly how hard the horse is working on any given day. When the workload is standardised, individual horses can be compared with each other to assess their fitness and ability. In every sport, serious athletes and trainers use heart rate during exercise to devise training plans and monitor progress. Unfortunately in the equine world we are still along way behind. Instead of using the heart rate of our horses, to gauge their effort and their recovery, we guess by relying on how the horse feels, whether he pulls, or needs encouragement, or how long he blows once he stops. Unfortunately these are not very accurate methods. In the past the equipment available to monitor heart rate during exercise was unsuitable for horses, so there was no alternative than to follow the traditional methods. Now we no longer have this excuse, affordable equipment is becoming readily available. These monitors detect the electrical signals that instruct the heart to beat, each electrical signal triggers a physical contraction of the heart. To pick up this pulse of electricity two conducting electrodes must be placed on the horse's chest above and below the heart. When the horse exercises, the sweat produced is sufficient to maintain electrical contact between the electrodes and the skin. The horse wears the electrodes and a small transmitter device attached to the saddle and girth. The only requirement is to keep the sensors pressed against the skin and keep movement to a minimum. Each time the heart beats, the transmitter sends a radio pulse to a watch receiver worn by the rider. The receiver counts the pulses and calculates heart rate and displays it. As most readers will be aware, heart rate monitors are widely used by human athletes and the same watch computers are perfectly suitable for horses. The only adaptation needed to make the units work, is to alter the electrodes. In the human breast strap, the two electrodes are positioned 4 inches apart which is sufficient to span the small human heart. However the equine heart is much bigger, so our electrodes must be much further apart. A basic horse heart monitor starts at around $150.00. The monitors can be of varying complexity and expense: All of them give an instantaneous heart rate, and others allow the rider to pre-program heart rate zones and provide audible alarms and timers to assist with monitoring training. The most sophisticated and expensive units allow accumulated heart rate information from one or more training session to be downloaded into a personal computer. It is worth remembering that the transmitters work for all the monitors, as a result the rider can upgrade from a basic to a more sophisticated system, or buy adapted electrodes and use the watch he uses on himself on his horse! How easy are heart rate monitors to use? Why is heart rate important? Resting heart rate is between 28 and 36 beats per minute in Thoroughbred horses. Maximum heart rate during peak exercise in the Thoroughbred lies between 225 and 240 beats per minute. The huge range of heart rates available to the equine athlete is the most important mechanism for increasing the output of the heart during exercise. How do they help endurance horses? At low heart rates ( <140 beats per minute ) the heart is able to supply the muscles with all the oxygen that they need. The muscles are able to burn fuel very efficiently. This is called aerobic exercise. This type of exercise can be carried out for very long periods without fatigue. When a horse stops after aerobic work his heart rate rapidly returns to normal and he will hardly blow. In endurance competitions the goal is to keep the horse exercising at this level throughout. This allows the very long distances to be covered most efficiently. Keeping heart rate within this aerobic zone ensures rapid heart rate recovery when exercise stops. The end result being that the horse exercises happily for longer and is rapidly released from veterinary checks. For this reason the most successful endurance horse is rarely the fastest. A canny competitor will use a heart rate monitor to keep his horse in the aerobic zone and make sure he's quickest out of the vet gate! At higher heart rates (up to 240 beats per minute) the heart can no longer supply the muscles with all the oxygen that they need. Fuel burning in the muscles is less efficient and a substance called lactate builds up in the blood. The heart rate at which lactate begins to accumulate is known as lactate threshold. Once this heart rate is attained, any increase in speed, or effort, results in more lactate entering the blood and is called anaerobic exercise. High heart rates and the build up of lactate rapidly cause fatigue, so anaerobic exercise cannot be continued for long periods. Galloping, sprinting and hill work all increase heart rate and cause lactate production. Heart rate recovery following anaerobic exercise is much slower, the body is in oxygen debt and the accumulated lactate must be disposed of; this process takes time. 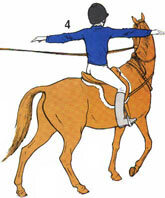 This means a long wait before an endurance horse is released from a veterinary gate: Plenty of time for the rider to watch, whilst slower horses arriving much later, wave a cheery "Goodbye" as they leave. During anaerobic exercise the muscles use more fuel and generate more heat. This is not a problem during a 3-minute flat race, but in a 100-mile endurance ride, a horse that spends long periods above his lactate threshold will deplete his energy reserves and dehydrate long before his event is completed. Because of differences in the ability of muscles to use oxygen and in the heart's ability to supply oxygen, each horse's heart rate response to exercise is different. Each horse also has a different lactate threshold. A rider who uses a heart rate monitor during competition can ensure his horse stays comfortably within his aerobic zone whatever the terrain or climate. At home, the monitor is equally useful for interval training: Multiple short periods (1 - 5 minutes) of work at speeds, or gradients, inducing higher heart rates (anaerobic exercise) separated by periods of work at lower intensity, are very useful for improving the body's ability to handle lactate. This means as the horse gets fitter, he can go much faster with a lower heart rate and minimal accumulation of lactate. In other words, the rider has created the ultimate endurance horse. 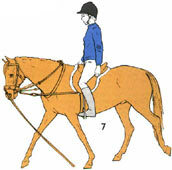 At any level, exercises in the saddle help to develop your balance and confidence on the pony. 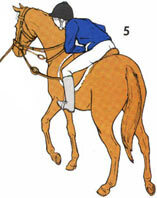 Riding can be very tiring and your muscles can start to to ache after only 30 minutes. The more used to the basic riding movements your muscles become, the less stiff you'll be. It's possible to exercise at home if you don't have your own pony. Stand with your feet placed about 60cm (2ft) apart. Keep your upper body straight but not stiff. 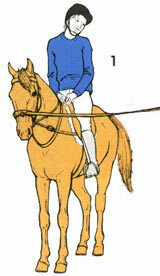 Then just bend at the knee slightly, as though you were sitting on a pony. There you are, in position for riding! Bounce a little at the knee, straightening and bending. Do some of the arm exercises here as well and you'll soon be supple. 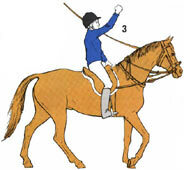 With your horse at the halt, hold on to the pommel with one or both hands. Slowly move your head ten times as if your nose was drawing a figure of eight. This relaxes your neck muscles. Hold the pommel with your left hand and put your right arm out horizontally. make a clockwisecircling movement, as if you were drawing a big circle with your fingertips. Do this three or four times, then change hands and repeat the exercise. Holding on to the pommel with one hand, punch the air with your other hand. This loosens your shoulder and back muscles. Repeat the exercise six times with each arm. Stretch both arms out to the sides, at shoulder height. From the waist, turn to your left. Push your left arm as far round to the left as you can. Do this several times with both arms. Body twists are especially good for your balance, and for making your waist supple. Sit upright and put your hands on your hips. Bend forward, as far as you can without tipping over. If you feel unsafe to begin with, do this exercise with one hand on the pommel. Repeat five times to strengthen your stomach muscles. Put your right hand on the pommel. With your left hand lift your left leg as far back and up as it will go. Hold it there for a second or two. 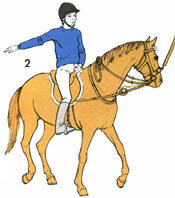 Release your leg and, without looking, let it drop down so that it falls more naturally into the correct riding position. Repeat this exercise four or five times with both legs.